Cassio Pet Resort & Training Center, one of the most sophisticated facilities of its kind in the Northeast, is a state-of-the-art environment boasting individual dog guest rooms as well as indoor and outside exercise areas. Our feline guest room is separate from the canine area with large windows that allow your feline to watch the outdoor activity. Nestled in the woods of Newtown, Connecticut is this 100- x 70 foot, two-story lodge that has been designed for the security, comfort, safety and well-being of your pet. Each guest room was created with the comfort and well-being of your pet, no matter their size. Two air-circulating and heating units contain a custom-designed filtration system allowing the air to be circulated up and out through ducts above each guest room. This filtration system rids the inside air of dust, odor, pollen, mole spores and viruses commonly found in many kennels. The temperature is kept at a comfortable 65-75 degrees and piped in music create a calm, soothing atmosphere. The Cassio guest quarters are staffed 24 hours a day by dedicated professionals who live on the premises. However, we do adhere to strict business hours. Joy S. Brewster has been an active member of the Greenwich Kennel Club for more than 35 years holding various Officer positions during that time. After 20 years as our Show Chair she was named Show Chair Emeritus. Joy still maintains a major role in our show and enjoys developing special features and events for our exhibitors and spectators. She has been a significant driving force behind our successful yearly point show and embodies the principles of fairness and good sportsmanship. Her background in dogs as an owner, breeder, exhibitor since childhood, transformed her into a nationally-acclaimed all-breed Professional Dog Handler. 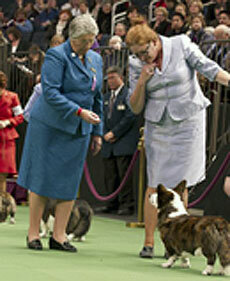 Joy handled top winning dogs in six of the seven American Kennel Club groups over her 37 years as a professional handler. In 2002 she retired from handling and embarked on a career as an AKC dog show judge while further expanding her knowledge and participation in training dogs for various performance events and as household companions at her commercial kennel in Newtown, CT.
Approved AKC Judge for Sporting, Hound, Toy, and Herding Groups along with Best in Show, Miscellaneous Breeds and Junior Showmanship-All Breeds. She is also a permit judge for the Non-Sporting group and an AKC Canine Good Citizen Evaluator. Member of Association of Professional Dog Trainers; various Dog Show Judge Organizations, and Vice-President of the Stony Hill Four Corners Association; a sitting member of the Newtown Animal Control Advisory Board; and a member of the Judges Education Committee and the Standard Review Committee for the German Wirehaired Pointer Club of America. She has been actively involved in the promotion of a better dog understanding and environment for more than 50 years.